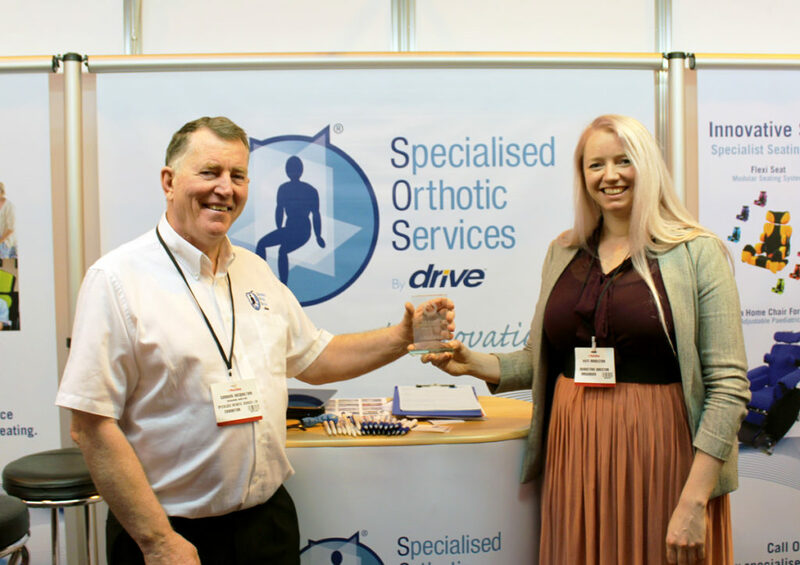 With Naidex 2017 coming to a close for another year, we are pleased to announce that SOS are finalists in the Naidex Professional award. The award is recognition of the quality service we provide to our clients. The judges visited our stand on the second day of the 3 day exhibition at the NEC to hear our 60 second pitch on why we deserve the award (and try out our P Pods of course!). SOS has been manufacturing specialist seating, mobility and positioning products for over 35 years. We work closely with NHS Wheelchair Services, Occupational Therapists and Physiotherapists to ensure that clients receive the best -possible seating solutions. As part of the process, we will always try and accommodate more complex needs. Our products are all made to order allowing us to find robust solutions to complex seating problems. Our exhibition stand included all of our latest products including the Hydro-Pod Hydrotherapy Flotation Device and Glider, Miko and Flexi Seat combination for Schools and Nurseries. For the second time this year, we offered the option to purchase P Pods from our stand along side our other standard moulded products. Congratulations to GrandCare for taking the top spot for their Senior Care Technology Systems.